SweetRush makes a smashing debut at the 2018 Learning Technologies Awards, one of the most prestigious Learning and Development (L&D) competitions in the United Kingdom. 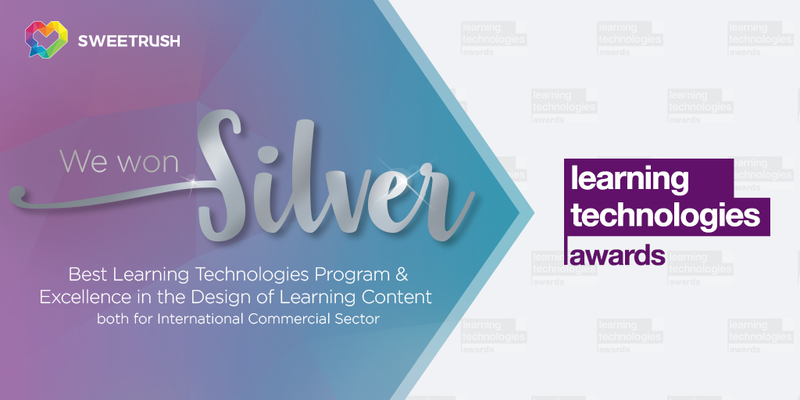 San Francisco, Calif., November 29, 2018 — Learning Technologies recently announced the winners of its 2018 awards, and SweetRush took home two silvers, highlighting its strengths in custom content design, eLearning, mobile learning, and learning games. SweetRush was recognized in the Best Learning Technologies Project – International Commercial Sector category and in the Excellence in the Design of Learning Content – International Commercial Sector category, along with its client-partners Bridgestone and Mondelēz respectively. The Learning Technologies 2019 conference will be held February 13 and 14 at the ExCeL London. Come meet the SweetRush team at Booth E05. For the complete list of winners, visit the Learning Technologies website. Congratulations to all the winners!